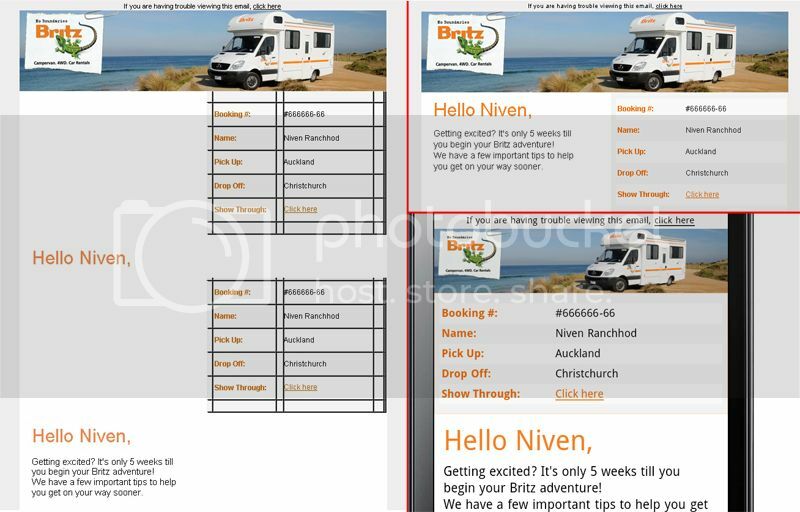 So I am currently working through some practice responsive email designing and developing since starting a new job and it's going awesome! My design is working well in all clients when render testing, but I am hitting a snag in Lotus Notes 6.5 & 7. On the left is Lotus Notes 7, on the right is how it should look on top and how it should respond on smaller screens. So... How can I get rid of the borders, and stop the second table which I have aligned to the left from going below. I have read the choppyness of the rendering engine for Lotus will be effecting the result, but this then means I can't tell what is my bug, and what is a rendering bug. Firstly credit to you for attempting to understand Lotus notes, that's very brave of you. So the boarders are coming from where you've set the styles border-bottom: 1px solid #FFE3CD; border-right: 1px solid #FFE3CD; on the table, I think Notes is taking that to be the same as setting border="1" take that out and it should work. I wish you the best of luck with Lotus Notes. The minimum we support is 8.5! Haha, it's more of a personal vendetta. We are the same, unless absolutely necessary for the specific client. Okay, figured out the stacking issue. Was to do with my ordering, with the details table being aligned to the right but being first in the order, for responsive stacking.